King Rama V or King Chulalongkorn (1853 – 1910) was the monarch who steered Thailand clear of colonization and initiated the Chakri Reformation to put Thailand on the road to modernization. King Chulalongkorn was appointed king at the age of fifteen after the death of his father King Mongkut in 1868. Chao Phraya Suriyawong acted as regent until the young king was twenty and old enough to ascend the throne in 1873. With the benefit of a Thai and western education, King Chulalongkorn was well equipped for his future role. His English tutor was Anna Leonowens, whose controversial memoirs were to cause deep offence to the Thais a century later. This education however, enabled him, like his father, to grasp the prevailing international political situation, which was then dominated by the western colonial powers. The Fifth Reign was fraught with extreme difficulties. The greatest threat to the kingdom was the growing demands of Britain and France, which threaten the independence of Thailand. He knew it would be disastrous to stand up to the gunboat diplomacy of these powers. Well aware of the dangers of closing up the country, he wisely chose to do what we would now call constructive engagement. Internally Thailand faced the problem of border provinces that threaten the integrity of the kingdom. Determined to modernize and strengthen Thailand against these threats, King Chulalongkorn started a series of reforms that became known as the Chakri Reformation. In the first 10 years of his reign he faced stiff resistance from the old ruling families who were jealously guarding their vested interests. The young king shrewdly waited for the old guard to outlive their time. He realized that diplomacy had to be conducted directly with western governments and not with their colonial counterparts in Asia, who were more in favor of extending territorial influence. By skillful diplomacy, King Rama V balanced London and Paris off against their colonial governments in Asia and one foreign power off against the other. As part of his modernization program, King Rama V implemented several changes to the government. Civil service – In 1888, the ministries responsible for various regions were reorganized along functional lines. More ministries and a civil service school were added. A cabinet was formed in 1892 to formulate national policy. Commoners were accepted on merit and not family connections. By the gradual staffing of new blood, King Rama V broke up the dominance of the old ruling families. Finance- Collection of state revenue was centralized at the Ministry of Finance instead of at individual ministries. Other reforms included a central budget system, an audit system and the separation of the King's finances from the state. Foreign Affairs – King Rama V appointed the brilliant Prince Devawongse as the first Minister of Foreign Affairs. Known as the father of Thai foreign affairs, Prince Devawongse was instrumental in neutralizing the demands of Britain and France. Military – The army was reorganized along the lines of a modern army with the establishment of a military academy and military conscription in 1902. Education – Generations of young men of common birth were educated overseas. National education was conducted in standardized Central Thai instead of local dialects. Besides stressing religion, the system reinforced loyalty to a single king. Infrastructure – In 1883 telegraph services were established, followed by the first railway in 1891, roads, housing, postal services and an irrigation system for the central plains. The kingdom was opened up to foreign expertise and foreign education. Social reforms – On ascending the throne in 1873, King Rama V abolished slavery. This was implemented in stages to reduce the social impact and forced labor was completely eradicated by 1905. The king also held public audiences to allow the people to speak directly to the king. King Chulalongkorn traveled abroad extensively in Asia and Europe to see at first hand modern government. 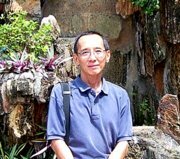 He was convinced that Thailand needed European technology but not at the expense of Thai tradition and independence. His far-reaching reforms reflected a vision years ahead of his time. By 1910, Thailand remained uncolonised. But the price was heavy: the loss of half a million sq km of territory on the borders with Burma, Cambodia, Laos and Malaya; the loss of tax revenues from extra-territorial rights of Europeans in Thailand who were exempt from Thai taxes and laws. King Rama V died on 23 October 1910. Widespread national mourning followed his death. That day has been declared the day of the Great Beloved King. As one of the most revered monarchs in Thai history, his photograph is displayed in many Thai homes, companies and shops to this day. The King Rama V Equestrian Monument where thousands flock on 23 October every year to pay homage to him, stands to the south of Dusit Garden, the palace created by him. It's a monument to a great king who left his legacy in the history of Bangkok and Thailand. 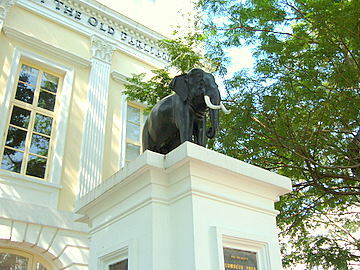 The bronze elephant stands on a white pedestal outside a colonial building in the old city district in Singapore. This was a gift from King Rama V to the British government in Singapore. King Rama V acceded to the throne at the age 15. When he reached 18, the young king toured the British and Dutch possessions in Malaya, Java, Burma and India from 1871-72. This tour was planned by the regent Chao Phraya Suriyawong to educate the king in modern public administration to prepare him for his future duties. The gift of the bronze was made on 16 March 1871 when King Rama V visited Singapore, the first foreign country to be visited by a Thai monarch. It’s appropriate that this gift is placed outside the oldest building in Singapore. Built in the early 1800s, the building was the home of a merchant John Argle Maxwell. The original structure was designed by a prominent architect G D Coleman who was responsible for several other historical buildings in Singapore. The colonial government leased this building from Maxwell in 1827 and later purchased it in 1841. 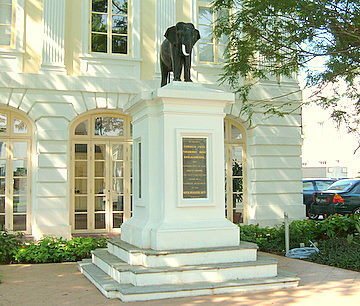 At the time of King Rama V’s visit, the building housed the court and other government offices. By the 1950's, after several renovations the building became the Legislative Assembly House. When Singapore got independence in 1965, the building became Parliament House until the new Parliament complex was completed in 1999. 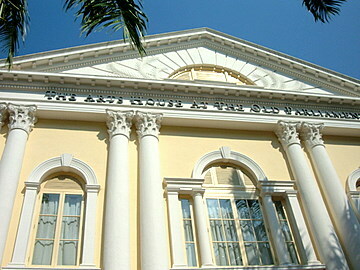 Left empty for almost five years, this historic building was finally restored and converted to the Arts House in 2004. 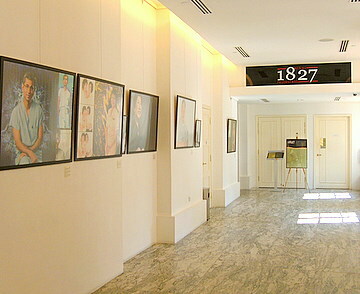 Today, it’s now an exhibition center for contemporary arts and fittingly a Thai restaurant named 1827, the year the building was acquired. To return to the splendour of Dusit Garden.